This improved version of the Micro DRO has a flush fitting probe, longer read out travel, and can attach to a smaller area - but it is more difficult to make. The construction details for my original design of the Micro DRO can be seen here, and while it works well, I decided it could be improved upon and cleaned up quite a lot. Reading the first blog is recommended as it provides useful information, including how to disassemble the cheap digital tyre tread depth gauge, various modification options, and a link to an excellent site describing several variations of the the Micro DRO which you can build. Some are quick and easy to build, some more complicated - you choose. I originally designed the gauge to readout increments when milling on my lathe, and it makes that job a lot easier. It's way better than any thing else I've seen. It can quickly attach and read out the cross slide, vertical slide, and carriage travel regardless of the amount of slop and backlash in existing controls. This is a huge plus. I couldn't be bothered with the hassle of having a fixed DRO. The cheap ones just get in the way, they cost too much, and don't take kindly to the cuttings and oil contamination that working lathes produce. So I came up with this idea and it's one handy little gauge that you just attach as required. For most jobs you only need a readout for fine increments and finishing anyway, and it does that admirably. And it's dirt cheap. It attaches to ridiculously small areas that no other portable gauge can match. Having a flush fitting probe is the main advantage of this version. It's the way to go. I use it a lot, particularly when milling and thread cutting. Well worth making. Below is a photo from the original blog showing what's inside these units - not much. It's very similar to the standard read head circuit board found in most cheap digital calipers. The display refresh rate is however very much faster than the relatively sluggish DROs that hobbyists make out of cheap digital calipers. Rolling through the 0.01 mm increments is very smooth on this display. In addition to having discarded the flat metal spring that applies friction to the slide, I removed both wings from the black ABS plastic base for this version. Another option is to straighten the flat metal spring so that it applies very light pressure. This may assist the read repeatability by reducing any tendency for sideways movement of the capacitive beam if manufacturing tolerances are a bit loose. Worth considering. After dismantling the earlier effort, I reworked my original design. - inserted a suitable low tension spring to mate against the screw head. 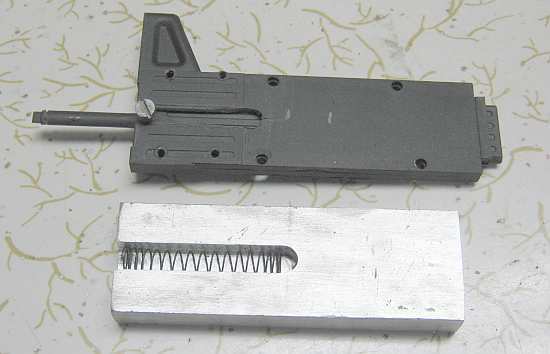 The length of the slot and the spring determine the amount of readout travel available. With the right spring it should be possible to get near the full original 25 mm readout. I just went with what I had. After doing all this, I assembled the alloy base, gauge back, slide and read head together to see if the spring tension was right and if it all worked properly. To tap a screw into the slide I had to file off a lug near the probe end, and drill into that area as there is no where else to do this. I later found out that this lug actually helps set the clearance for the reader, as well as being a stop for the slide. The metal scale also became exposed near where I drilled the hole AND the steel screw made contact with the copper substrate. The end result was that the read head went crazy from a combination of all of the above. - and grind the exposed copper substrate away with a micro die grinder - as below. This solved the problem, but getting the read head clearance right was a real hassle. It has to be within a very specific range. I must have assembled/disassembled the unit 20 times to add and remove packing (cello tape) before I got it right. Next I milled the alloy base to fit a steel plate for the magnet holder. Make sure the base and plate will be parallel to the probe, to eliminate parallax error. The steel plate was recessed to take four flush fitting single magnets which were Araldited into place, and then the plate was screwed and Araldited to the alloy base as seen below. 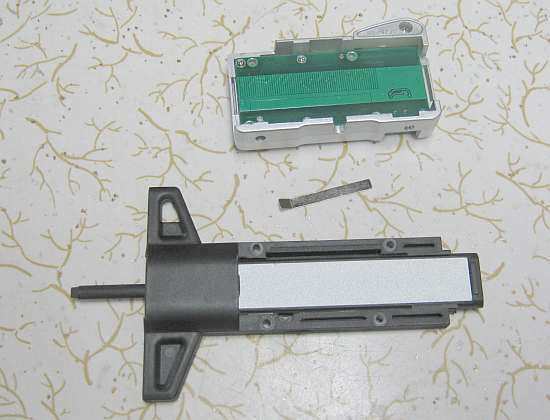 The slider, black ABS base and read head were then assembled as a unit. The spring was fitted to the alloy base, and mated with the screw head protruding from the slot in the black ABS plastic base. The alloy and black ABS plastic base were then Araldited together. A metal end cap was made and Araldited to the probe end of the assembled unit to keep out cuttings and for a neat finish. The probe was then cut to length to allow a flush fit when the spring was fully compressed. There's no way you're ever going to be able to disassemble it, but as the components are so cheap, it's not an issue.